There is something special about the sound of a crisp caramel brûlée top cracking - and the addition of Brazil nuts makes it an even better experience. This rich and indulgent grown-up dessert can be made in one large or six individual dishes. Pour the milk, cream and Baileys™ into a pan and stir in the vanilla extract. Heat gently over a low heat until almost boiling. Meanwhile, in a separate pan, lightly whisk together the egg, egg yolks and half of the sugar, until smooth and creamy. Gradually pour the hot cream mixture over the eggs, whisking constantly, until smooth and combined. Cook over a low heat, stirring constantly, for 8-10 minutes, or until the mixture thickens. Pour through a fine sieve into a large jug. 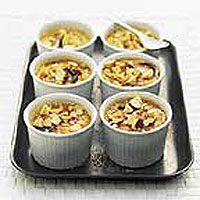 Slice the bananas and divide between 6 x 150ml ramekin dishes. Pour the custard mixture evenly over the top, tapping the dishes gently to level the surface. Allow to cool, then chill in the fridge for at least 2 hours, or overnight, until set. Just before serving, preheat the grill to high. Sprinkle the remaining caster sugar over the custards and grill for 2 minutes, or until golden and caramelised. Sprinkle with the chopped Brazil nuts and return to the grill for 30-60 seconds to brown lightly. Allow to stand for 1 minute to allow the caramel to harden, then serve. This recipe was first published on Waitrose.com in March 2004. Make one large brûlée in a 20cm flameproof dish, instead of using ramekins. This recipe was first published in Mon Mar 01 00:00:00 GMT 2004.